Has it happened to you that you work with Microsoft Outlook as usual, click on a message to read or reply to it, or take some other action you performed hundreds of times in the past, and all of a sudden Outlook won't open and not responding? From time to time Microsoft Outlook adopts quite an annoying habit to hang around even if the user persistently attempts to shut it down. Technically, it means that one or more outlook.exe processes would stay in memory preventing the Outlook application from closing correctly and not letting us, users, start a new Outlook instance. This problem existed in earlier versions and it may occur with recent Outlook 2013 and 2010. The first thing we need to do is kill all hanging Outlook processes. To do this, start up the Windows Task Manager either by pressing Ctrl + Alt + Del, or by right clicking the taskbar and choosing "Start Task Manager". Then switch to the Processes tab and find all OUTLOOK.EXE items in the list. Click on each OUTLOOK.EXE to select it and hit the "End Process" button. When something goes wrong with Outlook, Microsoft recommends that we start it in Safe mode. What does it actually mean? Simply that Outlook will be loaded without your add-ins and customization files. To start Outlook in Safe mode, click on its icon holding the Ctrl key, or enter outlook.exe /safe in the command line. You'll see a message asking you to confirm that you really want to start Outlook in Safe mode, click Yes. Does this cure the problem? If it does and Outlook starts working properly, then most likely the problem is with one of your add-ins, which leads us to the next step. If the "Outlook Not Responding" issue did not cause you troubles in the past, it stands to reason to turn off the recently installed add-ins. I usually disable them one-by-one, closing Outlook with each change. This helps to pin down the culprit that causes Outlook to freeze. In Outlook 2007, go to the Tools menu, click "Trust Center", then choose "Add-ins" and click Go. 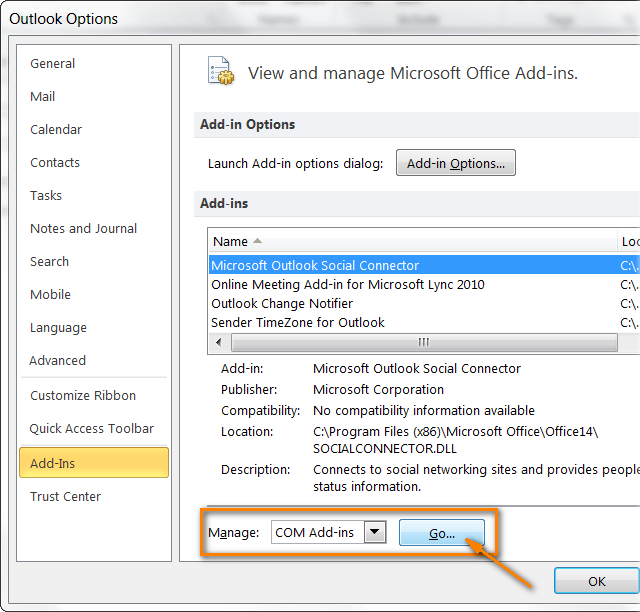 In Outlook 2010 and Outlook 2013, switch to the File tab, click "Options", choose "Add-ins" and click Go. Now all you need to do is to untick the add-ins and close the dialog. Outlook is one of the most complex applications of the Microsoft Office suite, which makes it extremely resource-hungry. Outlook may hang simply because it does not have enough memory to run or perform a required operation. This is often the case with outdated and low capacity PCs, however even modern and powerful ones cannot feel secured against this. Well, let's "feed" it by closing all other programs that you don't need at the moment. Use the Inbox repair tool (Scanpst.exe), which is included with Outlook installation, to scan your Outlook data files (.pst or .ost) and automatically repair damaged parts and errors, if any are found. First off, you need to close Outlook otherwise Inbox Repair won't start. Then open Windows Explorer and navigate to the C:\Program Files\Microsoft Office\OFFICE14 folder if you are using Outlook 2010. If you have Outlook 2013 installed, it will be C:\Program Files\Microsoft Office\OFFICE15. Double-click Scanpst.exe and click "Browse" to select the .pst or .ost file you want to check. Open the "Options" dialog to choose the scan options and click "Start" when you are done. If the Inbox repair tool spots any errors, it will prompt you to initiate the repair process to fix them. If you need more detailed step-by-step instructions, Microsoft has them ready for you - Repair Outlook data files (.pst and .ost). Compact the Outlook data file. Know that simply deleting unneeded messages does not make the size of your .pst file smaller, nor does it recover the space on your hard drive. You need to specially tell Outlook to compact your data files. Before you do this, remember to empty the Deleted items folder so that Outlook can compress your data file. In Outlook 2010, you will find the Compact option on the File tab, under Info > Accounts Settings > Data Files tab. Choose your Personal folder and then click Settings. Go to the General tab and click Compact Now. Alternatively, in Outlook 2013 and 2010, you can right click the Personal folder (such as Outlook or Archive), then select Data File Properties > Advanced > Compact Now. For other Outlook versions, please see Microsoft's instructions: How to compact PST and OST files. Archive your old items. One more way to reduce the size of your Outlook file is to archive older emails using the AutoArchive feature. If you need the detailed instructions, I'll refer you to Microsoft again: AutoArchive settings explained. Since we've started to talk about archiving, be aware that Outlook consumes even more resources than usually when it is archiving your emails or synchronizing messages and contacts with your mobile device, which results in a bigger response time. Don't push it and let it finish the job :) Usually, Outlook displays a special icon on its status bar or on the Windows system tray when auto-archiving or synchronization is in progress. Don't take any actions in Outlook during this period and you'll be safe. Sometimes outdated or over-protective anti-virus / anti-spam programs can conflict with Outlook or with one of your Outlook add-ins. As a result, the anti-virus blocks the add-in and prevents Outlook from functioning properly. How do we deal with this? In the first place, check whether your antivirus is up-to-date. Reliable and trusted antivirus software vendors do care about compatibility with Microsoft Office applications, so there is a good chance that the issue is fixed in their latest update. (BTW, it's a good idea to check whether the latest updates and service packs are installed for your Microsoft Office as well.) Also, make sure that Outlook itself and your Outlook add-ins are added to the trusted applications list of your protection software. If the above does not help, turn off the antivirus and see if it brings Outlook back to life. If it does, the problem is definitely in your antivirus software. In this case, you can either contact its vendor for assistance or simply choose another protection program. If none of the above suggestions helped, try to repair your Office programs, as the last resort. Close all Office applications and open Control Panel. 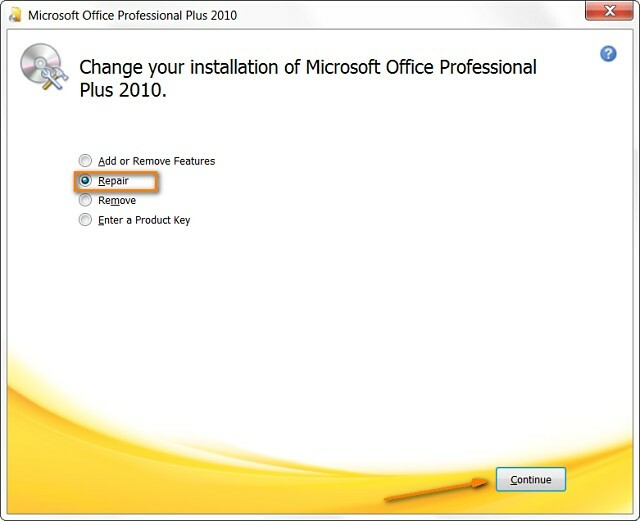 Find Microsoft Office in the list of installed programs (it is under "Programs and Features" on Vista, Windows 7 or Windows 8, and under "Add or Remove Programs" in earlier Windows versions) and right-click it. Select Change, then choose Repair and click the Continue button. If you have never repaired your Office programs before, simply follow Microsoft's instructions for your version of Windows: Repair Office programs. 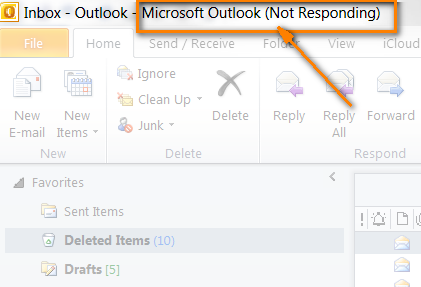 That seems to be all, I hope this information will help you solve the "Outlook not responding" problem efficiently. If you have any questions, drop me a comment and I will try to help. 89 Responses to ""Outlook Not Responding" error - working solutions for hanging, freezing and crashing problems"
Thanks for suggesting an useful method. It is fully compatible with Outlook 2013 on Windows 8 PC. I followed the mentioned reference and got satisfactory result. Of course, Stellar PST repair seems to be a prominent utility for MS Outlook users. this is a life saver, couldn't get this info anywhere else! have to post again because this really saved me! I am glad to know these tips worked for you. Thanks for your comments! Great advice. Halted a potential melt down I was going to have because my email wasn't working. All now working fine and following compacting the .pst file, PC has sped up massively. I have tried all of the options and nothing works, outlook still does not respond. i can run OK in safe mode. I cant even run in safe mode. Which means i cant even go to Tools to check the add ins. You can try to run Scanpst.exe to repair your Outlook Data files. If this does not help, then try repairing your Office programs. Nothing of it worked. My outlook2007 gives me about one minute to work normally, then it hangs (EVEN IN THE SAFE MODE). Mainly with messages from eBay. Hanging lasts for about 15 to 50 seconds with increasing tendence, then it allows me another click before hanging again. It looks like an eBay allergy..... Almost no trouble with other e-mails. help, then you can probably contact Microsoft support. The default path C:\Program Files\Microsoft Office\Office14 won't have the utility if your operating system is 64bit. and you'll see it there. Easy to follow and worked like a charm. Thanks a million! I tried a lot of other "solutions" which were blind alleys. You directions did the trick! Scanpst.exe is in Program Files X86 if you are on 64-bit version. hopefully somebody can helop me with this issue. When I start Outlook 2013 in Windows 8.1 from tiles, it will start and minimize into the task bar. The inbox will not open. I can start outlook in safe mode: outlook /safe. When I log in as Administrator Outlook will start using the same outlook profile. I looked at outlook profile, Add-Ins, scanpst pst-files. Everysthing ok. Even repairing, uninstalling and reinstalling office has no effect on this issue. Any ideas where else I could look at. Does outlook leave any messages in logfiles? I am very sorry I have no experience with Win 8.1. I've actually tried it but after a few days downgraded to Win 7. I am using outlook 2007 in my new laptop but I am not able to delete mails from outlook while from my webmail I can delete the mail. Under the advanced tab in outlook options try disabling hardware graphics acceleration. This worked for me. But it hasn't made a difference. I still get the annoying "Not Responding" note when trying to boot-up Outlook in normal mode. I can only get rid of it by going to the Task Manager. And oddly Scanpst.exe is nowhere to be found in my system. I even did a search for it. Thanks for any other suggestions you may have. Try to run Outlook in safe mode and then turn off Hardware Acceleration. If this does not help, set the display's color depth to 16 bit. Please see the following page for the detailed instructions: Fix Outlook hanging on Loading Profile. If this does not help either, the only solution that I see is to reinstall Office or try to reach the Microsoft Support team. This was awesome in helping me solve a persistent Outlook issue. It was so annoying that I began to look for a replacement. Great solutions! Starting in Safe Mode as Administrator and removing the add-ins fixed the problem immediately. Thank you so much for your info - Microsoft should be paying you because their solutions are pathetic. Another "virtual" beer is on its way Alexander :) Been having similar problems to Andrea for the last week or so and everything I've tried to correct to now has failed. So today went through all your steps 1 by 1 and no joy until I turned off the hardware acceleration as outlined in your link and bingo problem appears solved (fingers crossed!!). Thanks for posting such comprehensive and easy to understand instructions that gives us 'non techos' some hope of fixing ourselves. Much appreciated! By any chance are you equally knowledgeable about the glitches going on with Windows Live Mail? Yes, I'm one of those weird people who uses Outlook for my calendar and Windows Live Mail for e-mail but it's suddenly causing me so much grief I may have to switch soon if I can't find a solution. IMHO, you'd better move to some other email client. From my experience, Microsoft's free tools leave much to be desired. Fixed my problem of Outlook opening (thanks again :)) but now two sessions of Outlook open each time......not a real drama closing one but is there an easy fix?? In our case, emails would intermittently hang/stick in outbox when using Outlook 2013 with MS Exchange Server. Problem was solved by updating router firmware to latest version. I believe I solved my problems by deleting a backup. I have backed up my personal folders when I upgraded my outlook to 2013 from 2007. After a few days I launched a search into the back up to find a file. Shortly after that outlook started crashing at start-up. When I ran the repair tool I noticed that it defaulted to the backup. I deleted the back up and ran a repair on the current files. Problem appears to be solved. I click on Outlook Express and the blue box that says Outlook Express 6 comes up and just stays there....frozen....and you put the pointer on the box and an hour glass shows. It never goes to our emails. It sounds like the computer might be trying to do something...not sure...so what is going on? Why does it not go on to our emails and just stays frozen like that. I am sorry I cannot suggest anything regarding Outlook Express because I do not use it. You can probably contact the Microsoft Support Team for assistance. I am using Outlook 2010 and I'm trying to activate or setup the automatic replies, but it goes something like hanging and then pop up appears and it say " Your automatic reply setting cannot displayed because the server is currently unavailable. Try again later". but I check to the other users in our office it's all fine and working. My O/S was Windows 7 / office 2010. pls. help for the solution, many thanks. It is difficult for me to say what can cause the problem. You'd better address this question to your system administrator. I am sorry to hear this. Please try contacting Microsoft support service regarding your issue. still having problems. tried everything. in fact, things are worse. after cleaning up the pst files, now my outlook is looking for a backup file that I deleted. I've re-booted the computer, I've tried to repair outlook and Microsoft office, but I get message saying that it can't do it!! Need to get work done, and I am at the end of my rope here! need expert suggestion - I Have issue with 2013 outlook. all the time I will get not responding and I need to kill the service and restart it. we have office 365 service hosted in Microsoft and using MS office stander edition. I am having the 'not responding' Problem with a customers Outlook 2010 running on a Windows 7 64 Bit Machine as well. Outlook crashes as soon as it starts up, even in safe mode. It always starts with no errors after setting up and while synchronising the inbox i can restart Outlook as many times as i want, but as soon as the synchronisation is complete, Outlook hangs again after being restarted. Last test now I'm doing now is to use Outlook on the same machine with a new windows profile ... still snychronising and waiting for it to complete. 1 Turn off all the add-ins. 2 Temporarily disable your antivirus software. 3 Contact Microsoft support service (support.microsoft.com) regarding this issue. They may help you better. Go to C:\Users\%USERPROFILE%\AppData\Local\Microsoft\Outlook and delete spscoll.dat. As soon as I got rid of it outlook finally disappeared from my task manager process list. 2) Go to task manager > Processes tab > highlight Outlook.exe and end process. Most likely it doesn't go away if your on this thread. 3) Hold CTRL and open Outlook. When prompted select Yes to open in safe mode. As it starts to initalize simply close it back out. 5) Go to C:\Users\%USERPROFILE%\AppData\Local\Microsoft\Outlook and delete spscoll.dat, mapisvc.inf and your email account ending in.ost. If it won't let you delete your .ost file then simply drag it into your RoamCache folder. 8) Ponit the applet to your attached .pst file and let it run. If you have more than one then repair all. 9) After repairing .pst file(s) hold CTRL and launch Outlook again in Safe Mode. If all works well then close it out and try opening it normally. Reference # 18. I was having the exact same issue as Andrea. I could successfully open the program in Safe Mode. I unchecked all Add-Ins. But it didn't make a difference. I would still receive "Not Responding" error when trying to boot-up Outlook in normal mode. I could only get rid of it by going to the Task Manager. Then Outlook would open and then not respond again. Ran Scanpst.exe several times but did not resolve issue. The ONLY thing that resolved it was turning off "Hardware acceleration" option in OUtlook in NORMAL mode. I had taken ownership of many things on my C: drive to fix other problems. I fixed it by searching for outlook.exe and invoking 'run as administrator, no more aces problems, no more freezing. Fix it a problem and your outlook is not closed properly. How to solve the problem ? please help me? Hi Alexander, I am having problem with mail in control panel in windows 7, the mail in control panel is missing when ever I run outlook 2013 it will freeze I cannot make any changes to profile (create or delete). How can I solve this problem? please help? i am using office 7, my calendar is not opening up if you click something else it comes up with message: not responding, I have tried to repair also reinstalled office 7 but problem still there, please help. I have a problem where when I go into my email, Outlook only shows a couple of emails and files and has (PREVIEW) next to outlook name. Therefore I cannot do anything with the page at all?? I am with hotmail and usually goes to live.com and then my email would come up and no problems. I did not change to Outlook, it just comes up now and does what I said above. I would appreciate any help you can give me. Microsoft outlook 2007 hangs on loading profile..
3.stop the service.. [windows search].. I have facing..When i have open MS office 2007 hanging problem..
Hello, i have a pc with outlook 2010 installed however i bought a new lap top and on it was installed outlook 2007. i was trying to put in the same info as the 2010 but its not allowing me to log in...it would search and search and then kick me out. also ak me if i wanted to start in safe mode..i also get error that cant open your default email folder & i dont understand. Can you help i just wants infor to be working on my new pc. my new pc is windows 7 installed on it is outlook 2007. Hello mam/sir, i have a laptop using ms outlook 2007, when my ms outlook 2007 opened then i choose calendar then the outlook was crash? May i verify mam/sir what is the problem and how to fix it? Thank you. I tried everything. Outlook hangs in normal mode & safe mode. I did a repair but with no effect. I even reinstalled the entire Office 2013. Still I have the issue. Even tried with service pack. The problem still persists. Now my IT guy suggesting a total format of the system. My system is i7-4770 CPU, 8GB RAM, 64Bit Win 7 with Service Pack 1. Can you suggest something please? outlook 2007 continuously restarted again and again. Alexander for Supreme Commander!! THANKS!! Quit the Outlook.exe processes from the Task Manager .To do so, you need to press CTR+Alt+Del keys at the same time. 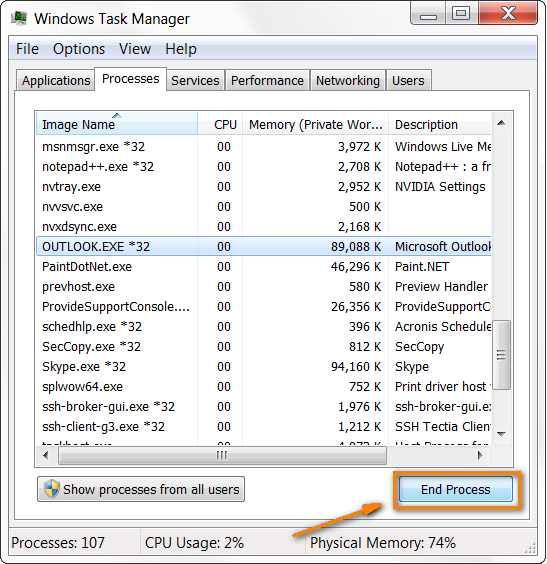 Select Start Task Manager and go to Processes and select the Outlook.exe processes and end those processing by selecting End process button. Also disable or turn off the Outlook Add-ins. For that go to Tools menu and click on the trust centre button and choose Add-ins to turn off. Hello from Bangkok, since this morning i m having this problem and totally trying with different vdo, after 12 hour trying i found your powerful advice, Thanks million times Alexander. ur such a genius. every day at some point I get a message "the data file outlook 2010 was not closed properly. and what about going back to the part where "if your outlook works on in safe mode do this" well my outlook didn't work in safe mode so then what...? Thank you very much. My Outlook 2010 is no longer hanging. Starting it on safe mode and unticking the addons worked wonders. Scanpst solved my issue. thanks.